Lucy ‘LuLu’ Buffett has done it again. 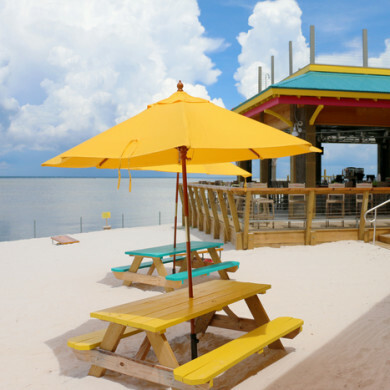 The sister of country crooner Jimmy has packed up her beach bags and taken her successful restaurant to the sunny shores of Destin, Florida – adding to her original operation in Gulf Shores, Alabama. Buffett says she always intuitively leaned toward Destin for a second location. After all, it had all the elements of the LuLu’s story: there was a bridge, it was off the beaten path, and it looked out over a beautiful bay. But you could call this place more than a restaurant – it’s an adventure, home of the ‘best backyard’ in Destin. LuLu’s sits on prime real estate, at the edge of the Choctawhatchee Bay, just past the popular shopping mecca Destin Commons. Diners have views of the water, where boaters and paddle boarders can float right up and grab a seat. Other ingredients in LuLu’s recipe include daily live music, a sandy beach for kids, the Mountain of Youth rope climbing course, the Fun Arcade and a gift shop selling T-shirts, hats, cookbooks and souvenirs. “We are always making it up as we go, so no telling what we will add in Destin,” she says. You can grab a seat in the brightly colored Adirondack chairs or at picnic tables with umbrellas. But your kids don’t have to sit still! Beach toys are provided in large plastic chests. Epic sandcastles are strongly encouraged. It’s a smart business owner who can make a beach bar and restaurant so entirely kid-friendly. Parents can (responsibly) enjoy a cold one, while their little ones run amok in a safe and fun atmosphere. All seating is covered in some way, whether you choose to dine indoors, on the covered patio or under an umbrella. There are pull-down doors if whether becomes inclement, and fans blowing full-blast to help beat the heat in summer months. As for whether Lucy’s brother may show up for an impromptu performance? Well, you never know when he might drop in for a bowl of gumbo.